Here's an updated article that's been in several Internal Martial Arts magazines, entitled: "Zhan Zhuang - What Really Happens When We Stand"
When one begins Zhan Zhuang training their goals generally fall into one of three categories: health and longevity, internal martial power and mental/spiritual development. And since most all achievement in the internal arts is based on greater and greater relaxation and integration, standing meditation naturally becomes an excellent method of choice for rapid accomplishment. An example of this can be a feeling of profound contentment, like we are exactly where we’re supposed to be as a human being. Heaven above, the Earth below and we, man or woman in between, nothing to do, nothing to achieve, just pure beingness. Or sometimes we feel as if our muscles are “melting.” When this occurs, the body will respond to our feeling-awareness and release blockages wherever we focus. The same is true of Nei Kung “energy experiences.” When we work with various Taoist alchemies or the like, our imagination becomes so refined that we can create experiences. But the question is, are these feelings and experiences real or just mock-ups of our imagination? With Zhan Zhuang however, there is generally no question whether some energy or feeling is real. Since we are not seeking any particular experience, just greater relaxation, when something does happen out-of-the-blue so to speak, we know it’s real because we had no part in trying to create it. Also after one of these experiences, we are often able to duplicate and utilize the new awareness. There are five locations on the bottoms of the feet, knowledge of which will greatly aid in our quest. They are: Yongquan, Kidney 1 - the bubbling well, the center of the heel, the big ball - located behind the big toe/second toe, the little ball - located behind the pinky/4th toe and lastly the Center Point, equidistant between the tip of the toes and back of the heel. This point is located directly below Jiexi point, St-41 when standing in Wuji posture. Jiexi point can be found on the midpoint of the transverse crease of the ankle in a depression between the two tendons. By leaving our arms relaxed at our sides as we do in the Wuji standing posture, our attention more naturally stays inside the torso. Test this for yourself. First, stand with your hands at your sides for a minute or so. Then raise your arms and form the embracing the tree/holding the ball posture and maintain that for a minute. Notice that as soon as your raise your hands, your conscious attention naturally tends to shift to the arms and upper body. Finally, return your arms to the sides of the body and notice what happens. Your feeling-awareness begins to leave the arms and return to the torso. In addition to this, the width of the feet can influence our ability to be aware of the spine. When we stand in a wide stance (shoulder width or wider) just as with the arms, our feeling-awareness tends to move to the outsides of the body. On the other hand, when we position the feet at hip width or narrower, of necessity we must stand “taller,” that is, stretch the body more vertically. This of itself brings greater awareness of the spine. What happens with enough practice is that more and more of the “Yin tissue” in the front of the body (chest, abdomen and innards) elongates and relaxes back toward the spine. This is especially true of the all-important Psoas muscles. When this occurs, the Yin tissue feels more insubstantial while the Yang Chi of the back becomes more tangible. 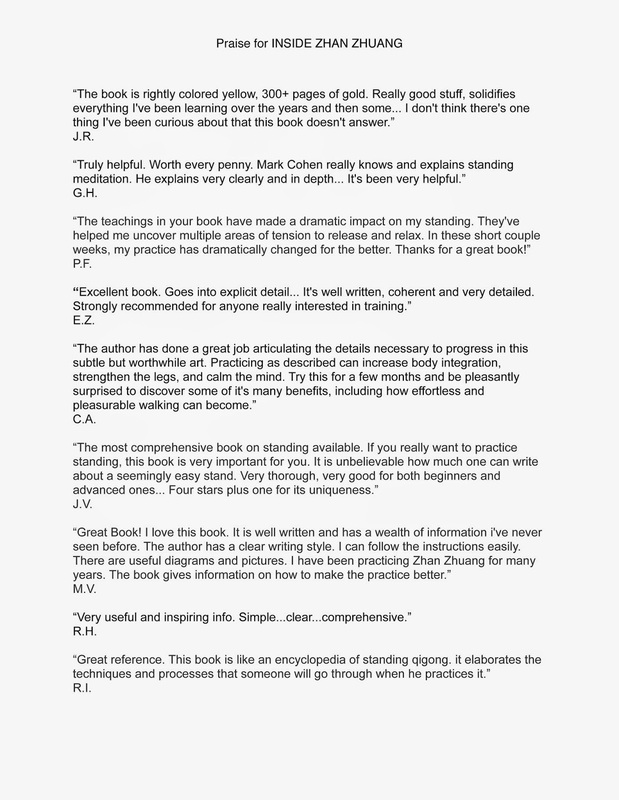 The importance of the spine both for health and martial achievement cannot be over-estimated. On the health side, the nerves of the spine energize all the organs and glands and much more. In addition, every nerve message which passes from the brain to the body and vice-versa, goes through the spinal column. On the martial side, the spine is central to issuing powerful Jin. For mental and spiritual cultivation of the Shen force, there two other techniques that can be very useful. The Half-Inside/Half-Outside Method often works well. There are a number of ways to find one’s center. The following method has been found to work extremely well. Place one hand on your Navel/Low Dan Tien area and the other at the Ming Men on the low back. Here it is important to note that there are actually two Ming Men. One is the acupuncture Ming Men which lies just below the second lumbar vertebra and the other is the Chi Kung Ming Men which is found between the 5th lumbar vertebra and the Sacrum. With a judicious hand placement you can cover both. In Zhan Zhuang, as with all the internal martial arts, there are many embedded layers of deeper and deeper integration, body coordination and application. On the physical side this includes, bone alignments, opening and closing the joints, stretching the tissue linearly and spiraling the tissue. 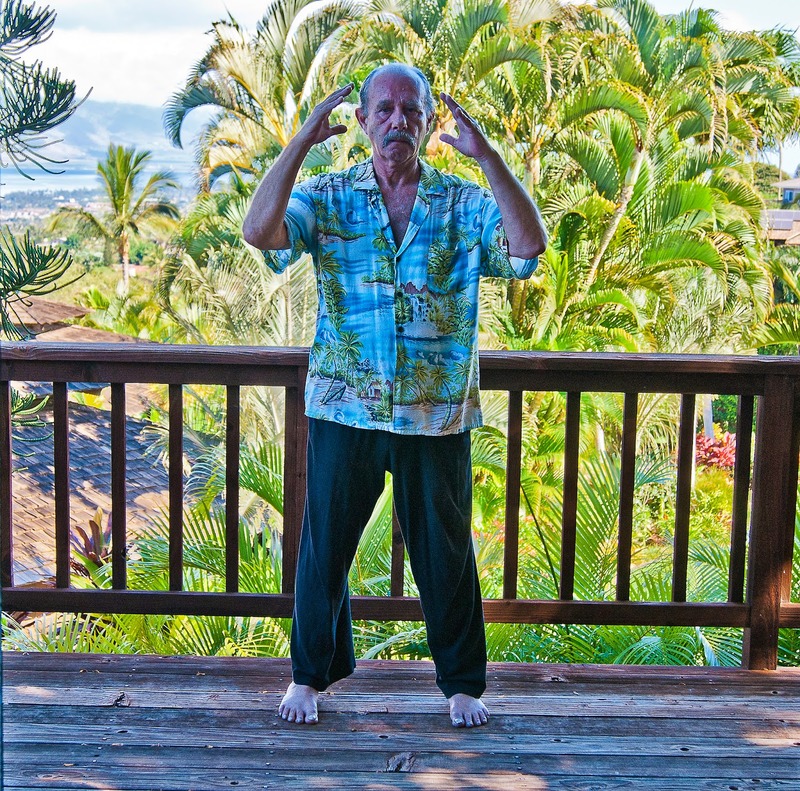 On the Nei Kung side, there are also many phases such as working with the Left and Right Chi Kung Channels, working with the Central Channel, working with the organs and glands, etc. Hardwiring is the mechanism that enables the linkage of the many parts of the body to a central location, in this case, the low Dan Tien. Later, in advanced practices, this central focus can be in other areas like the middle and upper Dan Tien or even multiple regions. But for health and indeed martial power, for now we’ll focus exclusively on the low Dan Tien or navel area. This method is most suitable to Zhan Zhuang as well as the other internal arts. Judicious use of hardwiring allows us to actualize the embedded layers of coordination available in each posture or movement. On a physical level, what we do is focus on one particular part of the body at a time in relationship to a central point, in order to create what some have called a dimmer switch. That is, the ability to activate part or all of one’s unified energy at will by focusing on just one energy center. For now, two basic examples should suffice to clarify the technique. The first method uses breathing to create the linkage, while the second relies on repetitive movement. The Breathing Method: Choose a part of the body. In the beginning this should probably be somewhere in the torso. For this example we’ll use the upper back. Next, focus your breathing in the low Dan Tien for a few rounds, until you feel a relative evenness between the inhale and the exhale. A feeling of body relaxation begins to occur. During this process you will have sensed a gentle expansion and condensing in the lower abdominal area. Now quietly shift your attention to your upper back and feel it expand and condense with the abdomen. Continue this process for a number of rounds while periodically shifting your feeling-awareness back and forth between the two areas. With continued practice you will almost be able to be aware of the two locations simultaneously. I say almost because our brain has the ability to switch between the two places at lightening speed, such that it almost feels simultaneous. I’m speaking about our conscious awareness here. First we feel this, then we feel that, only really really fast. However, there is another method which can superimpose or join the two locations completely. For that we must access our peripheral feeling-awareness while basically letting go of our fixed conscious focus and allowing it to become more amorphous. Here’s how: Focus your conscious feeling-awareness in your physical center which falls on the plane of the navel area, specifically, halfway between the navel and the outside of the back. Now, while keeping some of your conscious feeling-awareness there, let your peripheral feeling-awareness open to the region of the upper back. Feel the two locations rise and fall in unison. Later, in the Nei Kung practices you can create a sphere in your center and feel it expand and condense, taking whatever part(s) of the body you desire to link with it. Later, these spheres will begin to rotate, similar to the Dan Tien Rotation famous in Chen Tai Chi style. This turning or spinning is important because of how it amplifies, propels and accelerates the Chi. Eventually hardwiring will include the entire body, from head to toe and from inside to outside. When accomplished, our center will now act much like a dimmer switch in its ability to power the body’s overall energetic state either up or down, that is, increase or decrease it at will. In order to continue the hardwiring procedure, repeat the earlier basic process to link each region to the center, one-at-a-time. Please note, this should first start with the exterior muscles and sinews and then proceed inward to the deeper parts of the body, organs etc. Now for the Moving Method. This technique uses all the principals of the previous method, only now we apply the same foci while moving, say in Tai Chi form movements for example. So, while doing each movement singly and repeatedly, we look at one part of the body in relation to what the center is doing. Let’s choose the knees. What are our knees doing in relationship to the low Dan Tien during a particular movement? Are they coordinated, retaining their alignment, expanding and condensing in unison, sending and receiving, opening and closing together as one? The progression of hardwiring begins with individual areas of the body being linked to the center, but from there it expands step-by-step to include more locations simultaneously until eventually ‘everything’ is linked in. A good way to proceed after attaining the basic individual mastery is to use the external six harmonies. This involves hardwiring certain parts of the body to each other in addition to the Dan Tien. For example, we can work the linkage between the elbows and knees and then later use multiple pairs such as the shoulders and hips and elbows and knees. In Zhan Zhuang, the easiest way to affect linkage both to the Dan Tien as well as from one part to another, is by using the breath. With the Dan Tien method, breathe into the low Dan Tien and abdominal region until you begin to feel a gently rounded sensation like a sphere getting larger on the inhale and smaller during the exhale. Next, while keeping a percentage of your feeling-awareness in your abdomen, divert the rest of your feeling-awareness to the region you wish to hardwire. Relax the region as you inhale and expand the abdomen, allowing it to open and condense in unison with the Dan Tien. As you continue cycling your breath, you can check on both locations by rapidly moving your feeling-awareness between the two. When you get it right, you will find that the rhythmic expansion and contraction of the two locations and the breath, will have activated the Universal Pulse. This is the breathing of the Earth and the world around us including the sun, moon, planets and stars. Eventually, while the majority of your conscious feeling-awareness is held in your center, your peripheral feeling-awareness allows you to simultaneously feel what the rest of the body is doing. Imagine three concentric circles, each separated from the other. (See Diagram) Now put yourself in the center of the innermost circle. This circle represents our conscious awareness, what we can feel. The second circle represents our peripheral feeling awareness, what we can just barely feel, sense or glimpse. And the third circle represents what we cannot yet feel or perceive. 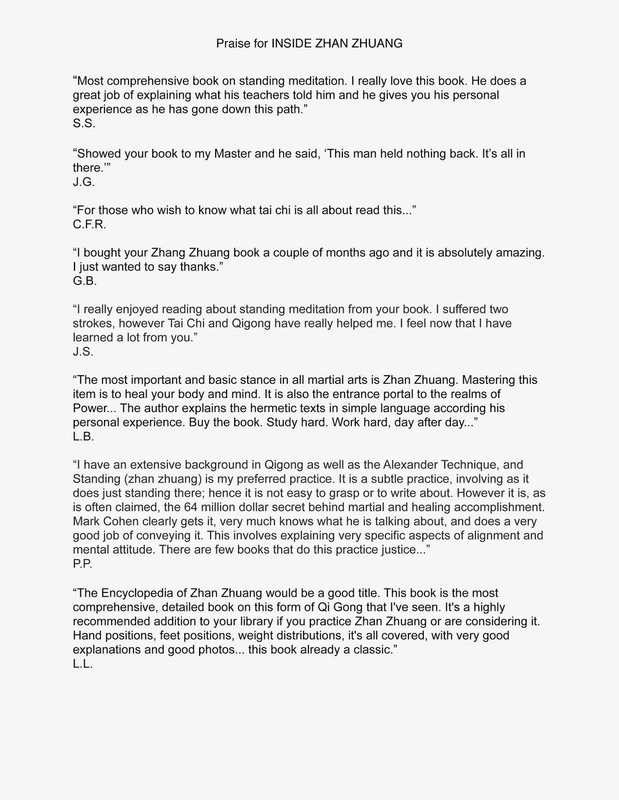 Excerpts are from the book, “INSIDE ZHAN ZHUANG” by Mark Cohen. Available on Amazon.